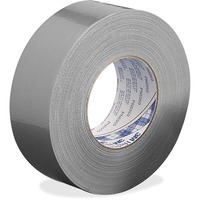 This industrial grade duct tape provides the tensile strength and adhesion for splicing, masking, patching, seaming, hanging poly sheeting, sealing PVC pipes, covering trip hazards and a host of other industrial applications. The high tensile strength provides a secure hold under stress. Tape bonds to most rough and smooth surfaces for a tight seal and resists wear, abrasion and water. Duct tape offers a 3 core and 8.6 mil thickness.